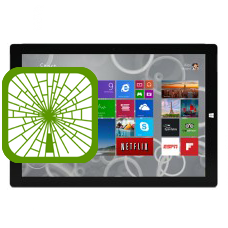 Let us fix your broken Surface Pro 3 tablet! With our in house repair service we remove your broken screen and replace it with a genuine replacement touch screen and LCD assembly. The benefit of our repair is you will have your SP3 back with all your data as it was and intact. A broken screen is classed by Microsoft as a non-warranty repair and they will charge you accordingly. This Surface Pro 3 screen repair service is a cheaper option and performed to exacting standards using genuine original parts. Sadly Microsoft do not actually repair your Surface Pro, you ship your surface to Microsoft and then they ship to you a refurbished Surface. They do not actually repair your device. Microsoft also do not transfer any data so you lose all your settings and documents, pictures, music, and any other data you value. You also will need to reload all your programs again. With our screen repair you get your own Surface repaired and returned. * Our normal repair turnaround times are 3 - 10 working days. We always aim to complete repairs as fast as possible. This is an in-house Surface Pro 3 repair service, when ordering this service you are required to ship your SP3 into our repair centre for works to be undertaken.